The new Xbox One Elite wireless controller isn't the only new gamepad Microsoft is bringing out this year, it's also set to drop the Lunar White wireless controller too. Rocking the same updated functions as the new standard controller - namely that 3.5mm headphone jack in the front and upgraded bumper buttons - the new white controller will be available on September 22. The new controller also has a redesigned grip, with 'an improved grip texture for more control and comfort'. We miss the old third-party Xbox 360 pad with the built in fans to keep your hands cool during gaming, but an improved texture that stops the pad flying out of your hands as you gesticulate wildly at an improbably Halo 5 kill can only be a good thing. 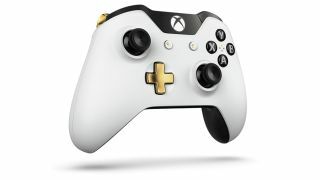 The Xbox One Special Edition Lunar White Wireless controller features gold, black and white styling and has almost completely ditched the colour coding of the face buttons. Those are now simply black and white, with the colours arrayed as dots in between the X,Y,A and B buttons. The new Lunar White controller will be a little pricier than the standard controller, at $65 (£55), but that's still less than half the price of the serious Xbox One Elite wireless controller that's also set to ship soon, though probably after the Lunar, in November. Xbox One vs. PlayStation 4 - which is better?